This week, it’s the Cadillac of full-size pickups we’re driving, namely the 2016 Chevrolet Silverado High Country 2500 Crew Cab 4WD. Delivered with the $9,115 optional 6.6-liter Duramax diesel engine that connects to an Allison six-speed automatic, this is indeed a Chevy truck that not only meets all criteria for “Like a Rock” or “Chevy Tough” designation, it supersedes what truck consumers demand in this type of classification. The $9K Duramax option price also includes superior safety items like forward collision alert, lane departure warning and a vibrating safety alert seat if you veer off the road a bit. Throw in a heated steering wheel and power adjustable pedals, and you receive quite a bit for the money. As a member of General Motors’ (GM) family of trucks that includes its sibling GMC Sierra, our Silverado 2500 was a pleasure to drive in spite of its near four ton mass. The maneuvering process is made easier thanks to a new for ‘16 GM digital steering assist that offers improved steering response and handling awareness. Still, you must be constantly aware of Silverado’s size when driving in town or in tight situations. Under the hood sits the 6.6.-liter (402.7 cubic inch) LML nomenclature Duramax turbo-diesel that is the end result of a co-op between GM and Isuzu. This joint venture began all the way back in 1998 building GM diesels of different shapes and sizes. The current 6.6 began development in 2007 and was designed specifically for the Heavy Duty (HD) line of trucks and pickups. The Duramax evolution since 2007 is notable as the initial LML 6.6 turbo-diesel produced 365 horses and 660 lb. ft. of torque. In 2011, engineers felt it was time to up the ante so they tweaked camshaft profiles, induction, exhaust and the turbo boost to arrive at today’s 397 horsepower and a whooping 765 lb. ft. of torque at just 1,600 rpm. When coupled with the rugged Allison 1000 series automatic, you end up with a vehicle that can tow anything from a full-size tag-along house trailer to an easier task, like “towing” the kids to school every morning in the roomy crew cab interior. Thus, regardless of need, Chevy Silverado High Country HD 2500 is ready for your daily bidding. If you don’t need the amenity rich High Country Crew Cab with the Duramax, a full-size Chevy Silverado 1500 2WD with a V6 engine starts at just $26,895 while the HD 2500 series starts at $32,995 with a 6.0-liter V8 gas engine. The biggest Silverado of them all, the 3500 HD Series, starts at $35,250 with the V8. Notable, too, is the availability of a compressed natural gas (CNG) 6.0-liter V8 that your Chevy/GMC dealer is waiting to tell you about along with the other engines available. Other Silverado “new for ‘16” notables include adoption of the SAE J2807 trailer rating standards (important), a fifth wheel/gooseneck tow option, remote locking tailgate, and Chevy’s MyLink, Apple CarPlay and Android Auto built-in to its Bose eight-inch touchscreen Stereo/HD Radio/SiriusXM/Navigation system. The High Country model includes a special chrome grille, body-color front and rear bumpers, corner step rear bumper with six-inch tubular assist steps, beautiful spray-in bedliner and brushed metal door sill plates. Inside, you’ll appreciate the full leather appointed heated and vented front bucket seats with 12-way driver and passenger adjustments with special High Country leather stitching. 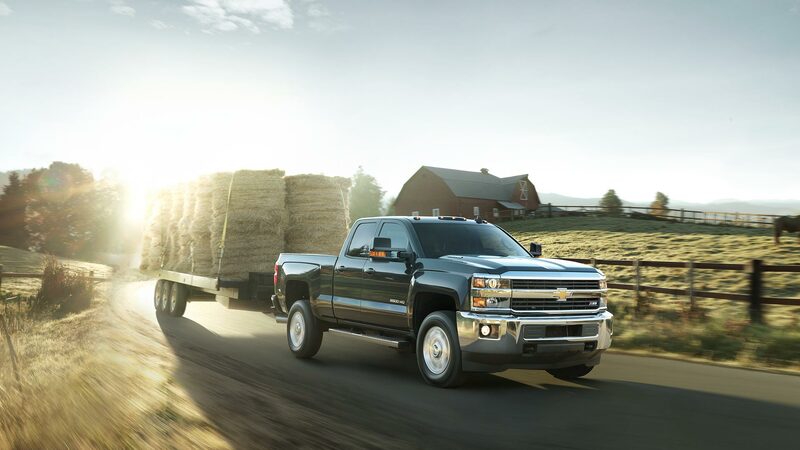 On the road, Silverado’s long/short arm independent front suspension combines with torsion bars and a semi-elliptical two-stage multi-leaf spring rear assembly that helps delivers the aforementioned excellent ride and towing toughness. This comfort-laced drivability factor nearly hides the fact that you’re behind the wheel of a vehicle that weighs close to four tons with driver and passenger, yet can still trailer 14,500 pounds from the tow ball hitch or 18,000 from the bed located fifth wheel/gooseneck. The 4×4 system relies on GM’s proven electronic shift transfer case and HD locking differential. Thanks to a 36-gallon diesel fuel tank, expect up to 680 non-towing highway miles that equates to about 18.8 mpg. However, owners know that while towing or driving in stop and go situations, it is substantially less. (No EPA numbers available). Other numbers include a wheelbase of 167.7 inches, 7,552 lb. curb weight, and 75.5 cu. ft. of long box cargo space. 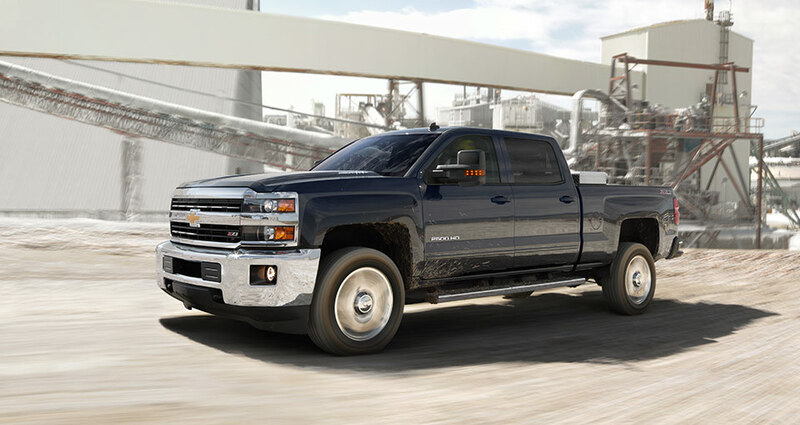 In summary, Chevy Silverado with the Duramax Diesel is all about towing, with comfort an added secondary. Best of all, a 2016 Duramax 2500 HD Crew Cab starts at $46,350 retail, and with current incentives you’ll do even better. If you need a workhorse and family hauler, this is the one.